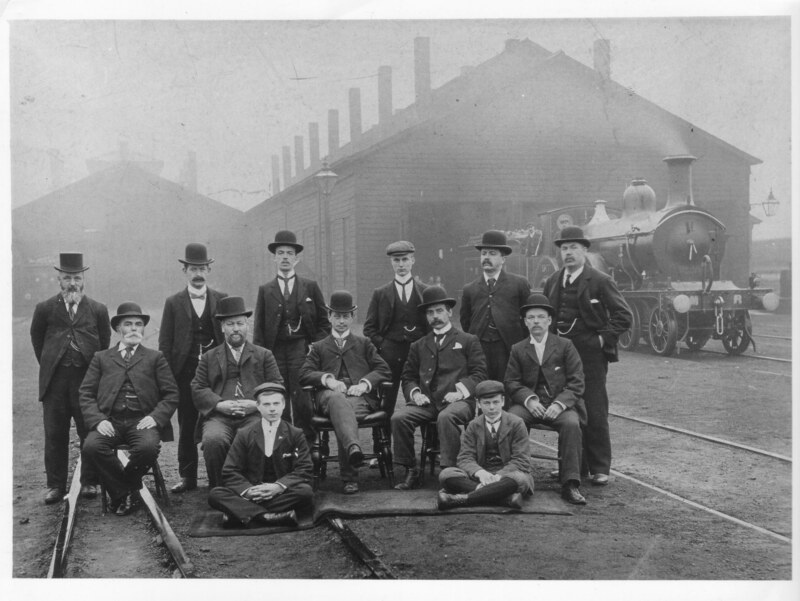 Group of railway men in front of the Skipton engine sheds. Steam train in the background. That is Jack Barrow of Skipton in the last row third from right. My great grandfather named Lambert was a driver in 1906. I always wondered if he was one of these workers. There are no photos to my knowledge. My g.grandfather Edward Swindlehurst was a driver at Skipton at this time. I have not got any photo of him but suspect that he could be the man on the far right seated row. Can anyone name these men please. The first seated man on the left of the photo (middle row) is Edward Beasley, engine driver. I think that the man standing in the back row, last right is Mr Fry, engine driver. The young lad third from the right in the back row is Jack Barrow of Airedale Terrace, Skipton, who worked at the engine sheds up until they closed. This photo is obviously taken outside the engine sheds and not in the station yard as stated. My grandfather, Arthur Booth, was a signalman at Skipton station box at this time. My Grandfather Charles Lawson, was an Engine Driver at this time, based in Skipton. Top row 3rd from the right is my great uncle Jack Barrow, Dr RG Rowley's uncle. Does anyone know if any of these men are James Herbert? He was a engine driver at Skipton around the time the photo was taken. KE note: Dr Geoffrey Rowley's uncle is bottom right.